Thousands of pounds have been spent on fire services helping to move obese people in Humberside over five years. 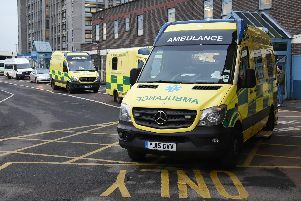 And the number of cases nationwide nearly doubled over the same period, with unions saying ambulance staff and equipment are being pushed to their limits. Figures from the Home Office show that the Humberside Fire and Rescue Service attended 151 callouts for bariatric assistance - helping ambulance crews to move obese people - between April 2012 and March 2017. While they represent a small portion of the service’s 21,000 non-fire incidents over the last few years, the majority of callouts took more than one hour to resolve. Of those, six incidents were over four hours long. Firefighters often need lifting equipment and special slings to transport people, and sometimes remove windows, walls and banisters. Freedom of information requests to some fire and rescue services have shown that the average cost of a callout is £400. For some non-emergency cases, services have been able to recover costs since legislation was put in place in 2004. Bariatric assistance callouts have become more common in recent years, with the Humberside Fire and Rescue Service recording 40 incidents in 2016-17. In 2012-13, there were just 17. Across England, fire and rescue services attended 851 bariatric assistance cases in 2016-17, a 98% increase on five years previously. Unison’s national ambulance officer, Alan Lofthouse, said that judgement on whether bariatric assistance was required was made by paramedics on a case-by-case basis. He said: “Obesity can be a real issue for ambulance staff trying to help critically ill patients. “Ambulance equipment has a safe working load, and pushing the limit puts patients and staff at risk. Tam Fry, the chairman of the National Obesity Forum, which aims to raise awareness of obesity in the country, said: “The leap in the frequency that fire crews have to winch very obese people from their homes is truly shocking. “The figures will continue to rise, however, even if the government were to implement drastic measures to combat the epidemic today.